Cut the cable and get access to FREE HD programs forever including local news, weather forecast and sitcoms,kids and sports programs etc. Before you buy, visit "antennaweb.org" or "antennapoint.com" check how many broadcast towers surrounding you within 50miles. 1, Check to make sure you have correctly connected the TV antenna to your HDTV or third-party HD receiver. 2, Re-Scan for Channels. In the TV's setup menu, set the mode to TV Antenna or Air. Refer to the TV manual for detailed instructions. 3, Reposition the TV antenna in a different location. Maybe place it higher on a wall or closer to a window. 4, keep the TV antenna away from those big power consumption devices interference, such as air conditioner, refrigerator and microwave oven... etc. 5, This is an amplified TV antenna. If a signal cannot be received with the external amplifier, remove the amplifier and try again. The actual receivable range may highly dependents on your distance and location.Areas with large obstructions such in valleys, mountains, buildings,etc will reduce effective range. Always re-scan for TV channels after moving the TV antenna, sometimes moving a few feet can make a difference. FULL FREE HD CHANNELS-- Cut monthly cable and get access to local news, weather, sitcoms, kids and sports, educational programs etc., Up to 80 mile HDTV Antenna lets you enjoy over-the-air networks in your area without paying a monthly fee. HD CRYSTAL CLEAR TV SHOW -- Please first visit "antennaweb.org" or "antennapoint.com" to check how many broadcast towers surrounding you within 80 miles. Enjoy crystal clear HDTV shows, 720p, 1080i, 1080p | ATSC available. HDTV antenna pulls in hundreds of crystal clear digital & HD shows! Receives free HD channels including ABC, CBS, NBC, PBS, Fox, Univision and more. 50-80 MILES RANGE & 16.5FT LONG COAX CABLE -- HD TV antenna can reach up to 80 miles and can be placed almost anywhere at home. With extra long 16.5ft coaxial cable, you can place the indoor antenna where the signal is the strongest. 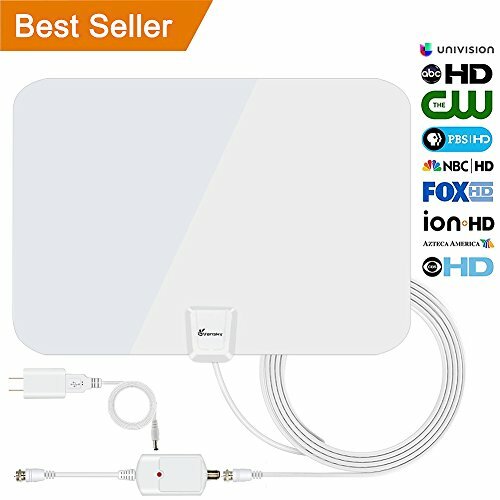 Makes indoor tv antenna easier to get the best reception, especially for customers whose televisions are quite far away from windows. DETACHABLE AMPLIFIER SIGNAL BOOSTER -- HD antenna amplifier is included to provide added range and maximum signal reception for more channels if you are far away from broadcast towers. IMPORTANT: This is an amplified TV antenna. If a signal cannot be received with the external amplifier, remove the antenna amplifier and try again. WHAT YOU GET -- Vansky hd tv antenna with 16.5ft coax cable, USB power adapter with spare cable,Amplifier Signal Booster,Spare 3M Sticker. Together with 45 Days Money Back, One Year Guarantee and Friendly, Easy-to-reach Support. If you don't satisfied with the channels you get, feel free to contact us.